This year I wasn’t as experimentative with the tomato selection, which is not to say what I’ve picked to share with you is boring….but maybe not as “selective.” Last year I got a lot of weird looks for what I thought were the greatest tomatoes ever. This year I got more of what people typically look for…big red slicing tomatoes, those little orange pops of sunshine, and regular red cherry…of course I still got the stripey ones and the intensely flavorful ones…afterall, what’s the point of heirloom tomatoes if you don’t try them all?? 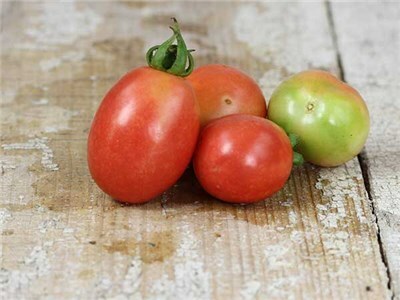 The first favorite type I bought is called Thessaloniki, it’s a big red slicing tomato, similar to beefsteak tomatoes – they’re big, red and juicy. Thessaloniki: A big, red, juicy gal, and early, which means you’ll get to enjoy her before any other tomatoes come in. 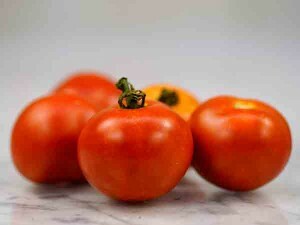 Our next slicing tomato combines a bit of our standard favorites with just a hint of funky fun. Robinson’s German BiColor Tomato is one of those fruits that is just downright beautiful. I haven’t ever eaten one, but I couldn’t resist this picture from Baker Creek. I’ve reserved 4 of these babies for myself and my family…but mostly for myself. I’ve been looking forward to these since starting them in January. They’re a late type, but I started them early, giving us plenty of time to enjoy them through the season. 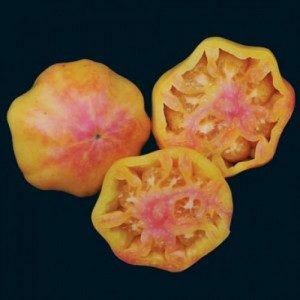 Mary Robinson’s BiColor: This large slicing tomato is more red than what’s pictured, with striking yellow and pink tones. For middle-sized tomatoes we’ve got two kinds, Topaz and German Lunchbox. 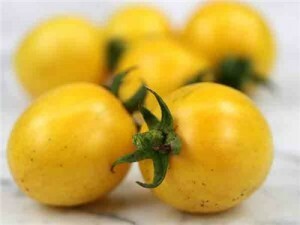 The Topaz Tomato is yellow with golden and green flecks, sweet, low acidity and my kids eat them by the dozens right off the vines. The German Lunchbox tomato is a little pink wonder. This tomato consistently produces right into November for me. They’re tasty when pink but you can leave them on the vine until they are a muted red…they are completely divine. German Lunchbox: Early prolific tomato, perfectly sized for snacks and producing all the way to the first frost. 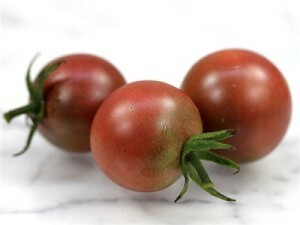 The Black Cherry is a tomato-lovers tomato. How could I go one summer without sinking my teeth into this Queen of Tomatoes? This is another variety that produces right up until the first frost. Also, in my constant search for veggie varieties that don’t require a lot of water, this one fits the bill. Too much water and the skins split. This one likes a little neglect. Black Cherry: All the flavor of a black tomato, in a two-bite package. I also got a standard type Red Cherry Tomato called Riesentraube. Another German Variety (have you noticed a trend?) And like the other German varieties this tomato goes right up until frost. Clusters of red globes are what sets this tomato off from a standard red cherry, this plant is incredibly productive. This year we’re trying out an heirloom version of the celebrated Sungold tomato. To the discerning tomato taster, our Sungold Select II is just a tad less sweet than the hybrid Sungolds you find in most markets but they still have that citrusy undertone. 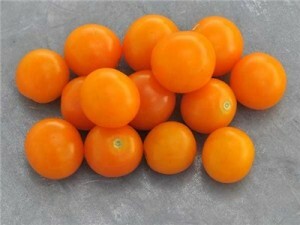 Citrusy sweet Sungold Select tomatoes…the heirloom version of a national favorite. We were also blessed to receive some tomato varieties like Yellow Peach, Myona Plum and Jersey Devil Plum. We’re not sure if they’ll be ready in time for a Mothers Day planting, but try us later in the year. We’ll update here if they become available, too. 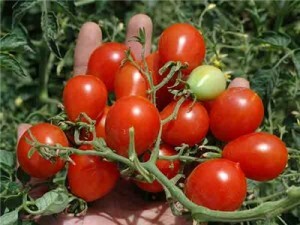 hello my dear, I would really Love to plant some tomatoes and I live on a Retired Dairy farm. I also would like to know pricing and about having a Great full garden. Pricing for designs varies by size of garden and whether or not you want raised beds.